Mahavir Traders is recognized as a place for quality, durability and innovation. These assets have made the company's products accepted all across the world. Our range of products has grown to more than 100 items in Two basic categories, namely, Grass and Coco. 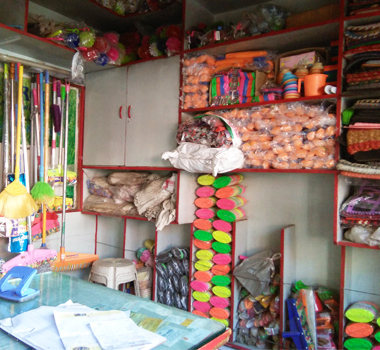 Mahavir Traders, Its a small unit of manufacturing and mainly Brooms, which was established in 1984. When Bhopal was not much developed and the city didn't had much to deliver in the terms of industry, still broom as an essential household product and is needed almost at all concrete or open structures, we saw potential in this trade. We took a small two shuttered shop and started manufacturing brooms. There were 4 skilled labors and the same two shutters were the manufacturing unit as well as office. Making the finest brooms with the selected grass from Orrisa and Assam we were the pioneers on this trade in the span of 10 years. Getting the raw material from the core areas was a major challenge which we faced and succeeded. In those days brooms used to be sold at the price range between 5 and 10 Rupees. Bhopal gave us the platform and we then moved towards the nearby areas. Surrounded districts like Vidisha, Sehore, Hoshangabad and Raisen were not a tough shell. Expansion in trade took us to all the cleaning products trade. We became the source for the retailers as a one stop solution for all cleaning products. Our direct connect with the user always gave us the strength to expand in all directions. Meanwhile we introduced the Brands Like : Aahinsa, Mayur, Neha and Home clean which are now available at various states. We are now a team of more then 125 people at almost 8 states with 1,00,000 consumers. © 2018 www.mahavirbrooms.com. All rights reserved.